i’m waking up this morning to the soft pounding of rain drops against my window. it’s a welcomed change from the sand paper noise that usually screeches against the walls. of course no one mentioned to me there’d be renovations here this week. the gloom from outside is confusing me. is dawn just breaking or am i halfway through my day already? i stretch out my arms, partly to release the muscle aches that cover my body from endless walks around the city, but mostly to reach out to the clock. as soon as my eyes settle on the time, i’m filled with enough excitement and energy to jump out of bed, throw on my sneakers, and rush out the door. even by my standards, this is early. too early to be rushing out of the house on a day where my to do list has three completely unimportant line items scribbled down. 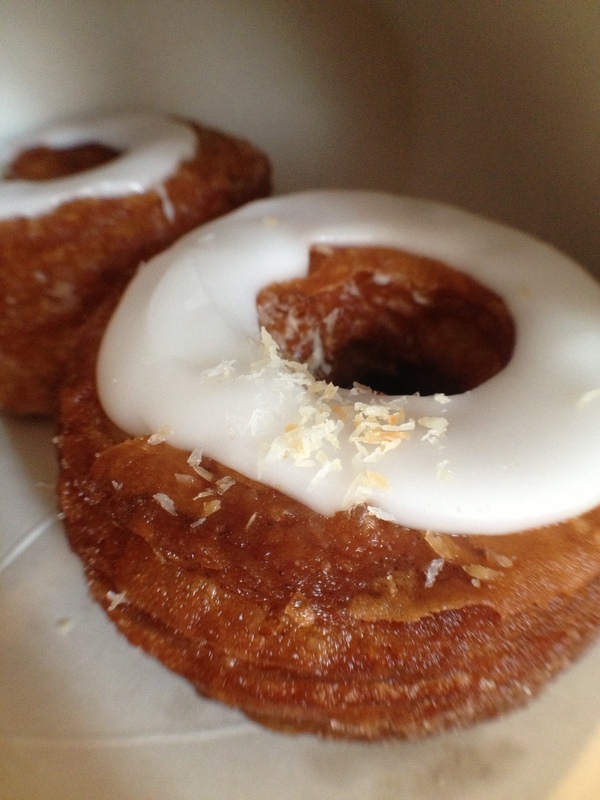 but it’s the only way i can sample the one dessert i haven’t been brave enough to wake up for yet: the cronut. i beam with optimism as i step into the rainy streets thinking i’m going to be alone in my endeavor. after all, how likely would it be for people to wait for hours in this rain? surely i’ll be one of only a few hyperactive eaters crazy enough to do this. i lose myself in thought long enough to step into a deep puddle of water that collected in a small nook between the sidewalk and the street. my socks are soaked and my usually clean bright pink trainers transform into an unappealing purple shade. i make a quick pit-stop at starbucks, thinking that my usual double-tall-non-fat-no-foam-latte will be enough to sustain me in my upcoming wait. my optimism is quickly challenged as i turn the corner from sixth avenue onto spring street. still more than an hour away from opening, and the line of other early risers, crazier than me, is turning around the block. i feel completely unprepared as i notice anxious patrons camped out with tarps, umbrellas and beach chairs on the curb. two police officers are standing in the closed glass doorway. i’m not sure if they’re there to protect the bakers from the hungry crowd, or if their presence is just another cop-and-doghnut joke waiting to happen. i do a quick scan of the crowd to measure my chances. i count 140-sh. the ‘ish’ is important. if i missed a dozen people, i’ll have no chance of tasting one of the 300 freshly baked marvels. so i scan again, and resign myself to the back of the line. i turn to the friendly face in front of me as she offers to split the shelter under her umbrella. we watch patiently as people give up waiting and walk away, and we begin forming an alliance. 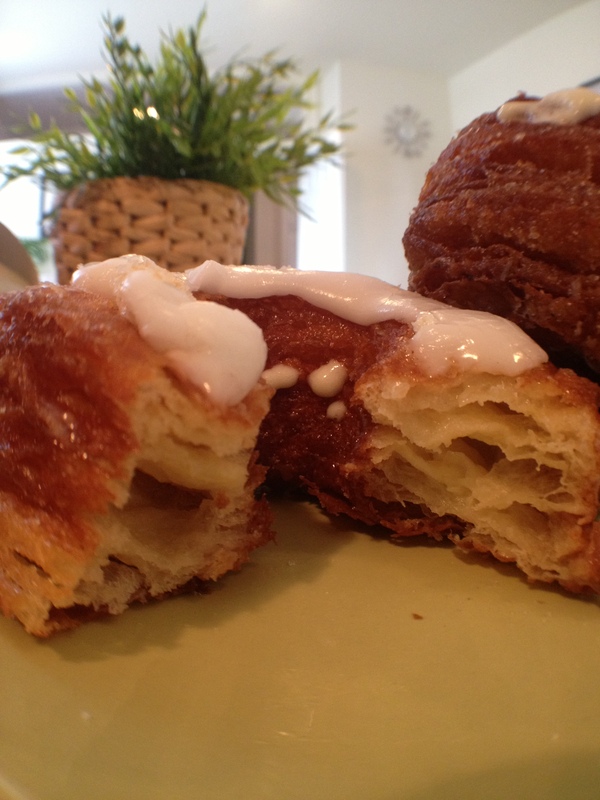 if there are only two cronuts left, she promises not to buy them both and let me have one instead. discussions turn to more serious topics, too intense for this time of day. i still feel myself waking up as i overhear strangers discuss babies and commitment, family members suffering from grave diseases, addictions and heartache. i start to feel the city wake up, too, with sounds of trucks rushing around corners, steel slightly scraping against asphalt , honking horns and buses passing by. hours have passed since i got here. and finally, i begin to inch closer to the door. they’re taking in groups of 10 at a time, and the closer i get, the longer the wait seems to last between waves. with no indication of how close they are to running out, someone from the bakery begins passing around warm and scrumptious mini madeleines. i wish i had more coffee left in my cup, they’d go so well together. nervous whispers begin making their way through the crowd that the stock of the day is dwindling down. i begin to admire the people that showed up at 5:30. in the end, their wait time will be just as long as mine, but they’re sure to secure their bounty. my fate of uniting with a cronut is questionable. finally, my three hour wait comes to an end. i make it through the doors of the bakery to hear that i’ll be having one of the last batches for today. my clothes feel a little drier and my feet are a little warmer. i pile a few more creative concoctions onto my order and walk out the door. i bite into it expecting to be completely overwhelmed with flavor. 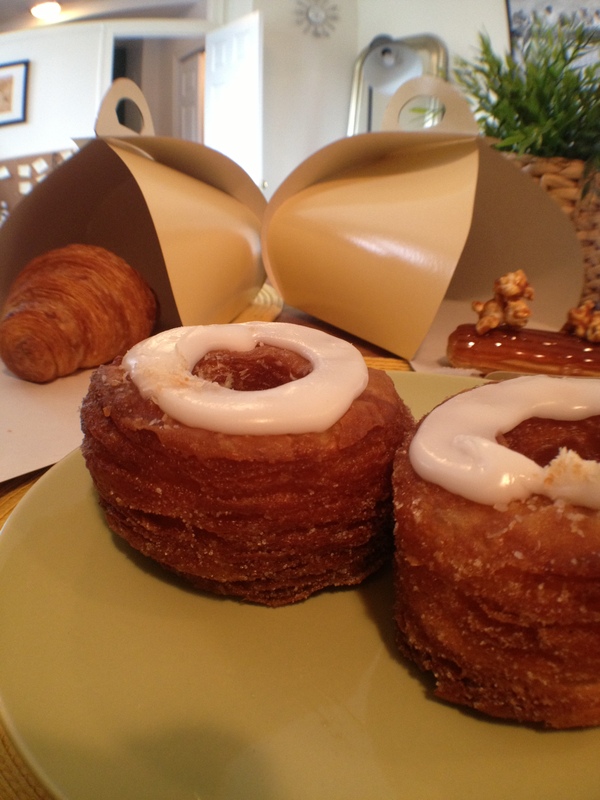 but i quickly realize that the experience of the cronut is more in the wait, the game that you’ll play in your mind to justify the time amongst strangers. it’s in the whimsical and random conversations of a soho morning. the challenge of waking up early enough when you have nothing else to do that day. the serenity of seeing new york while it’s still sleeping. the coconut cream filling oozes out, and as i lick the overspill from my clumsy fingers, not wanting to waste a bite of this treasure, the sugar rush kicks in. the flavors are getting more intense, the texture of the buttery layered flakes is settling comfortably on my tongue. the crispness of the glaze is tingling the edges of my mouth and i instinctively half-smile to myself. tomorrow i’ll sleep in. comfortable that a second serving awaits me in the fridge. 4 Responses to no reservations. that’s great to hear! hopefully one day we’ll be able to enjoy it together instead of just virtually.